In the last 5 years, I’ve gone from working as a research technician in a toxicology lab, to conducting ethnographic research about waste, to doing more cross-disciplinary work with CLEAR and throughout my PhD. During all this time, Discard Studies has been an incredible resource for keeping up-to-date on the latest theory, texts, and conferences in the field. Its also helped my transition across disciplines and introduced me (virtually or otherwise!) to a community of researchers, journalists and activists interested in waste and pollution. I’m incredibly grateful for the blog and the tremendous work that’s been put into it by long-term editor Dr. Max Liboiron and founder Dr. Robin Nagle. On September 1st, Discard Studies officially went live with the latest iteration of the blog (check out the opening post, here!). Some changes to the site include a new public interface, a Twitter account (! ), and a new post series called The Dirt (featuring latest texts, journals, calls for proposals, and research positions in the field). In addition to this, I’m super excited to be joining the Discard Studies editorial team, along with Dr. Josh Lepawsky. I’m also incredibly appreciative that as a graduate student, this work will be a paid position. This is rarely the case for graduate student editor positions, which tend to perpetuate a culture unpaid labour for junior and precarious scholars. Repair and maintenance are a part of how systems of value are built and maintained. Photo taken on 2 March 2002. From Wikimedia Commons. If you would like to support Discard Studies blog, please consider becoming a patron. Since starting my PhD in 2016, one of my favourite groups I’ve been a part of has been the Queer Science Reading Group. The group is comprised of a fantastic bunch of undergrads, graduate students, staff, and faculty from fields spanning anatomy and cell biology to geography to gender studies to medicine. We meet twice a month, drink tea, and learn about queer theory. In a, dare I say it, ~fabulous~ interview with Lady Science, group members Elise Earles (she/her) and I talk about what we’ve learned so far through the Queer Science Reading Group. Topics covered include doing queer placed-based science in Newfoundland, opportunities and incommensurabilities between settler and Indigenous queer activism, queer food webs, queer quant, our reading list, and more. Check out the interview, here: “Categories aren’t these things that are just there”: An interview with the CLEAR Lab’s Queer Science Reading Group’. The group will start up again in a new iteration this January. E-mail me if you’d like to join! Another CLEAR project that was recently published is the study, ‘A zero percent plastic ingestion rate by silver hake (Merluccius bilinearis) from the south coast of Newfoundland, Canada’, which is out now in Marine Pollution Bulletin. After not finding any plastics in silver hake off the coast of Newfoundland, we compared our results to the literature. We found that 41% of all recorded plastic ingestion rates for fish reported a value of zero. Despite the ubiquity of plastics in the ocean, this is not surprising given that where pollution goes, who and what it effects is always unevenly distributed (i.e. in this case, an effect of where plastics are located, how they float, where fish swim, what fish like to eat). Given low sample sizes reported in the literature, we are unable to determine what fish are most effected by plastic pollution– what is necessary for justice-based interventions. The key takeaways of the paper: (1) studies with higher sample sizes for a single fish type are important for understanding the effects of plastic pollution; and (2) report your null results! A rainbow of microplastics on Kamilo Beach, Hawai’i. Photo: Alex Zahara, 2012. You can read more about the study and it’s implications in the piece, ‘Not All Marine Fish Eat Plastics’ published on the Conversation by co-author Dr. Max Liboiron. Elise Earls & Alex Zahara (interviewer, KJ Shephard) (2018). “Categories aren’t these things that are just there”: An interview with the CLEAR Lab’s Queer Science Reading Group’. Lady Science. F. Liboiron, J. Ammendolia., J. Saturno., J. Melvin., A. Zahara., N. Richard., and M. Liboiron. (2018). A zero percent plastic ingestion rate by silver hake (Merluccius bilinearis) from the south coast of Newfoundland, Canada. Marine Pollution Bulletin 131: 267-275. Lab members during conversation about author equity, 2016. Photograph by CLEAR photographer-in-residence Bojan Fürst. Liboiron et al. (2017). Equity in Author Order: A Feminist Laboratory’s Approach. Catalyst: Feminism, Theory, Technoscience 3: 1-17. Author order is crucial; it is the currency of academia. Within STEM disciplines, women and junior researchers–those who are the primary constituents of our lab– consistently receive less credit for equal work. Our Civic Laboratory for Environmental Action Research (CLEAR) is a feminist marine science laboratory at Memorial University of Newfoundland, Canada. Recognizing that the stakes are high for CLEAR members, we have developed an approach to author order that emphasizes process and equity rather than system and equality. Our process is premised on: 1) deciding author order by consensus; 2) valuing care work and other forms of labour that are usually left out of scientific value systems; and 3) taking intersectional social standing into account. Although CLEAR’s approach differs from others’, we take author order seriously as a compromised but dominant structure within science we must contend with. That is, rather than attempt to circumvent author order, we stay with the trouble. This article outlines this process. This May, I pre-empted my Summer field season by testing out my proposed dissertation research at a couple of conferences. For my PhD fieldwork, I’ve decided to (a la an ethnographic refusal) examine a contamination issue closer to my home. The Canadian military in Prince Albert, SK, during wildfire evacuations in 2015. In Prince Albert, Saskatchewan, where I’m from, wildfires are a major source of smoke contamination, and– as much research has pointed out– often result in major displacement issues. So far, much of the research on wildfires has focused on the experiences of evacuated communities. This research has been in human dimensions and medical anthropology, and is concerned about how the North’s primarily Indigenous residents encounter wildfires and evacuations, focusing on the ways in which Northern life and culture becomes disrupted. For my research, I’ll be taking up Eve Tuck’s suggestion of ‘studying up’: I’ll be examining the history, culture and politics of wildfire management in Saskatchewan, focusing on how particular ideas of ‘nature’, ‘community’, ‘family’ and ‘wellbeing’ have come to be embedded in wildfire science and technologies. In doing so, I hope to keep open the possibility that wildfires can be managed differently, and in ways that foreground community self-determination and definitions of wellbeing. This proposed research was first presented at the Northern Exposures workshop and meeting in Edmonton, May 8-9th. The meeting was convened by my supervisor, Dr. Arn Keeling and involved discussions with long-term northern activists and researchers about the politics and ethics of doing research in northern communities. We talked about how and in what instances this type of research should be done (there are many instances in which it shouldn’t), how researchers make themselves accountable and to whom (e.g. to community determined deadlines, not to SSHRC). My proposal on wildfires was also presented in poster form at the Canadian Association of Geographers in Toronto, ON May 28-June 3rd. Very much looking forward presenting at the ‘Pollution, Environmental Justice, and Citizen Science’ workshop held at the University of Warwick, May 3rd and 4th, 2017. The workshop is part of the Toxic Expertise: Environmental Justice and the Global Petrochemical Industry research project, led by Dr. Alice Mah. The project focuses on debates arising between ‘experts’ and supposed ‘non-experts’ about contaminant-related issues. The paper I’ll be presenting is co-written with Dr. Max Liboiron, and examines the ways in which our lab, Civic Lab for Environmental Action Research (CLEAR), is incorporating the concept of ‘ethnographic refusal’ into citizen science. CLEAR is an STS-informed, feminist and justice-based marine science lab, directed by Dr. Liboiron, that examines plastic pollution. Abstract below. Cod is an important local food that was examined by CLEAR as part of a citizen science research project on marine plastics. Photo by Bojan Furst, taken during the Newfoundland cod fishery. Ethnographic refusal is an methodological approach originating in anthropology about not disclosing data. At first, settler anthropologists saw refusing to disclose all information as an ethical problem as the right to know was paramount. Over time, Indigenous scholars have rearticulated refusal as a decolonial and deeply ethical method; settler researchers and audiences should not be able to access all information about Indigenous and other groups, and that the refusal to recount some information so it remains locally controlled and related is sometimes the more ethical stance. In this paper, we explore how our citizen science laboratory (Civic Laboratory for Environmental Action Research, or CLEAR) has brought ethnographic refusal and people’s right to refuse into the natural sciences through a case of studying plastic pollution in sustenance food webs in Newfoundland, Canada. Refusal and other decolonizing methods are under-explored in citizen science literature and practices, and offer new avenues through which to think about methodologies and ethics for environmental justice premised on the idea that free and open circulation of contamination data is not inherently good. Okay, so after three months of reading and learning and thinking and writing (! ), I passed my PhD comprehensive exam and am officially a PhD Candidate (with distinction!). To this end, I am *very* much looking forward to the next few months and years of thinking through, learning about/from my dissertation, which will be about forest fire issues in Northern Saskatchewan. Much to come in that regard. into Nunavut’s Frobisher Bay. 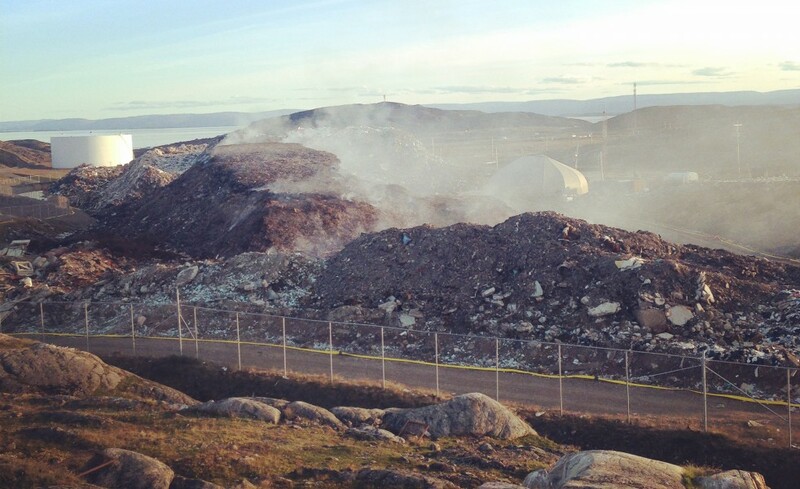 The dump – which burned steadily throughout the summer of 2014- is one of several waste sites in Nunavut’s only official city. It joins an unknown number of waste sites that the US and Canadian military, oil, gas, and minerals industries have left abandoned on and in the landscape. In this chapter, we examine waste within the wider context of colonialism as well as contemporary neoliberal governance practices to argue that waste itself is part of a colonial context within which Inuit and other Aboriginal peoples in northern Canada continue to live. Waste is a provocative material concept with which to think about neo-coloniality, and in the context of the Anthropocene takes on a distinct hue. Whether in the form of mining, nuclear, industrial, hazardous, sewage or municipal, and whether it is dumped, landfilled, incinerated or buried deep underground, waste constitutes perhaps the most abundant and enduring trace of the human for epochs to come. In this chapter, we take up the challenge posed by Dipesh Chakrabarty to conceptualize the neo-colonial subject within the context of the Anthropocene, wherein humanity is re-characterized as a geophysical force. While the Anthropocene speaks of a globalized human race to whom past and present generations project responsibility and reparation, we emphasize that the effects of this waste landscape – neo-colonialism’s dividend – is differentially experienced by Inuit people living in Canada’s North. Unlike Chakrabarty, we argue that the dangerous irony of the Anthropocene is less that the possibility of sovereignty has collapsed and more that the various technologies predicted to “solve” our global environmental problems are framed through an under- standing of sovereignty that always separates waste from resource, dirt from clean, and uncivilized from civilized—a configuration that, as the Anthropocene has already begun to show us, is inevitably doomed to failure.